Prof. Dipl.-Ing. Rudolf Voit-Nitschmann (emeritus) had a lot to do with designing the 1996 Icare II solar-powered sailplane and the 2011 e-Genius. 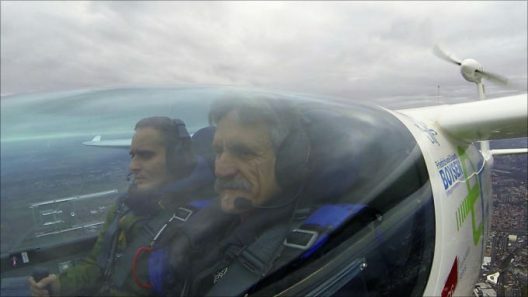 Icare II set several world records in its 20 years, most under the guidance of pilot Klaus Ohlmann. e-Genius won the award for being the quietest airplane at the Green Flight Challenge held in Santa Rosa, California, and was a close second to Pipistrel’s G4 in passenger miles per gallon (equivalent) energy use. Dipl.-Ing. Voit-Nitschmann was kind enough to explain to your editor how the propeller center came to be at the top of the tail on e-Genius. It’s a similar configuration to that on the Icare II*, and one he had found to provide the greatest undisturbed air to the propeller and the least added friction drag, since only the lower part of the blade crossed in front of the upper part of the vertical fin and rudder. This configuration was on display in abundance when both Icare II and e-Genius showed up at this year’s SmartFlyer Challenge in Grenchen, Switzerland. The SmartFlyer Cruiser’s development is based at Grenchen, and its four-seat design draws on Voit-Nitschmann’s basic approach to drag reduction. Another craft, Urs Villiger’s Traveler, a hybrid similar to the SmartFlyer, is still under development, but shows the same tail-propeller setup in a video from its Facebook page. Icare II and e-Genius had a central role in displays at the SmartFlyer Challenge and highlighted how at least the basic configuration could be adapted to different missions. Spectators had to be impressed that a 20-year-old, solar-powered craft could charge its batteries on a cloudy day, and still demonstrate impressive performance. Since the Challenge, e-Genius set two new speed records over different flight distances, making. an average speed of 235 kilometers-per-hour (145.7 mph) over 15 kilometers (9.3 miles) and 222 km/h (137.6 mph) in a flight over 100 km (62 miles). This broke the previous records by nine km/h (5.58 mph) and 44 km/h (27.3 mph) respectively. Stuttgart University reports, “The aircraft was flown by record pilot Klaus Ohlmann and Ingmar Geiß of the Institute of Aircraft Design. Both of the new world records were set in accordance with the regulations of the World Air Sports Federation FAI. 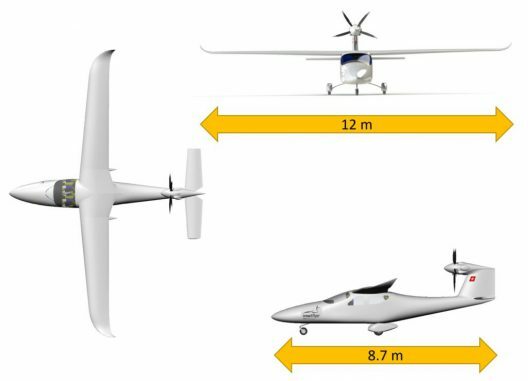 In the category „electric aircraft“ the e-Genius already holds five other FAI world records over different distances and reached altitudes. e-Genius and Icare II are by highly socially acceptable as they pass quietly, and in e-Genius’ case, quickly overhead. They have also led the way into making future craft, cleaner, quieter, and more efficient. *Icare II had its propeller behind the T-tail to allow folding for gliding flight.